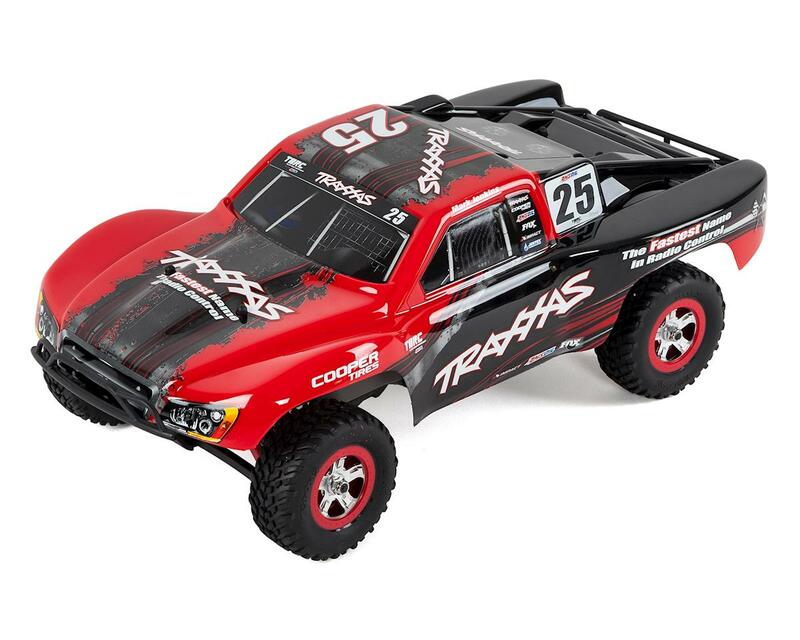 This is the Traxxas 1/16 Scale Slash 4X4 RTR Short Course Truck, with an included Traxxas TQ 2.4GHz Radio System, High-Torque Titan 550 12 Turn Motor, 6-Cell 1200mAh Power Cell NiMH Battery, a 2 AMP Peak Detecting DC Charger and Mark Jenkins body. Now featured with this kit are the updated Traxxas iD connectors now included as standard equipment. The Traxxas Slash set the standard for short-course fun and versatility, then the Slash 4X4 raised the bar on short-course performance with category-making speed, power, and track-ready handling. 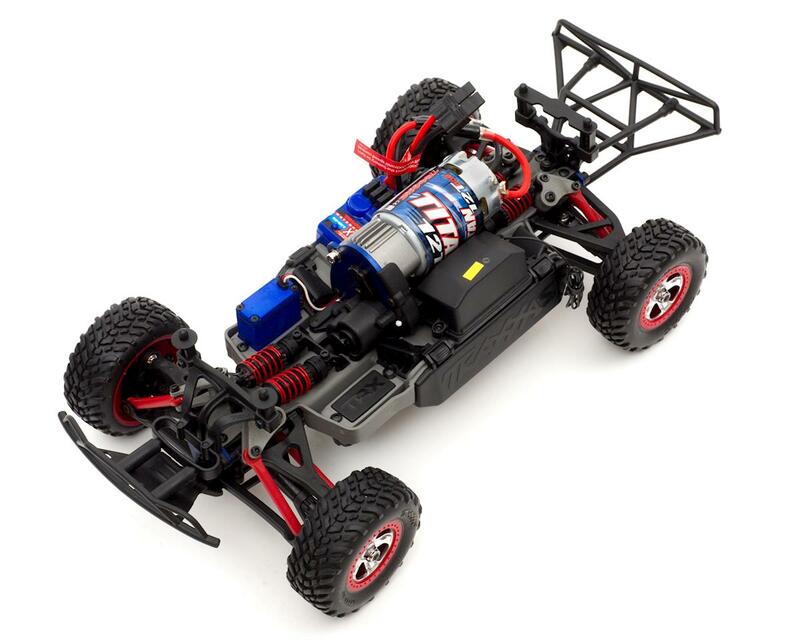 Now you can experience the fun of wheel-to-wheel Slash 4X4 racing 1/16 scale with high-torque Titan 550 power--the largest motor in the "mini" class by far! At 14 inches long, the 1/16 Slash 4X4 is about half the size of the 1/10-scale Slash 4X4. But don't call it a "mini"—this is a whole new category of R/C performance and fun that no mere mini-model can match. Short-course styling that captures the attitude of the full-size Traxxas TORC-series racer is just the beginning. 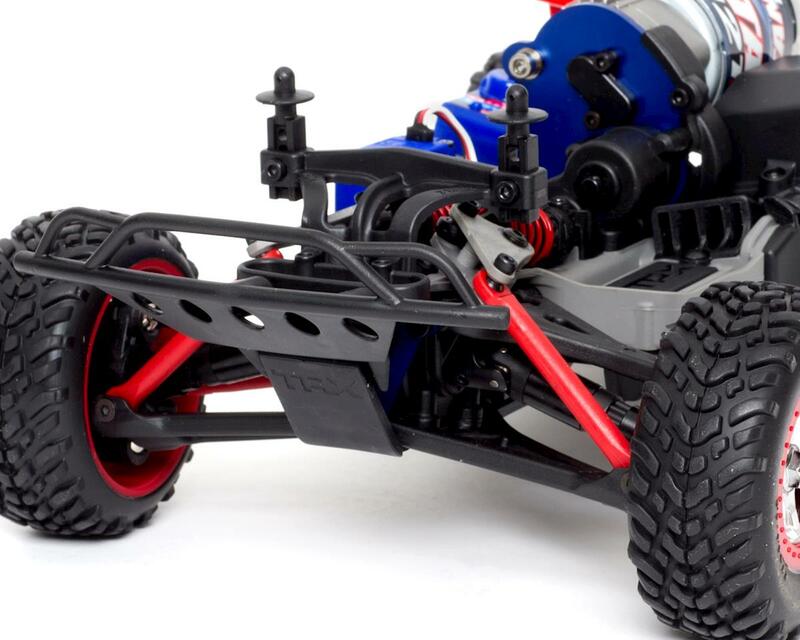 Beneath the Race Replica polycarbonate shell, you'll find the winning suspension technology of the eight-time National Champion Traxxas Revo and the convention-busting innovation of the E-Revo. Titan 12-Turn 550 Modified Motor: 1/16 Slash 4X4 includes a powerful Titan 12T 550 modified motor with internal cooling fan. The Titan's over-sized armature (30% larger compared to 540-sized armatures) is equipped with 12-turns of pure copper wire for big torque and increased power-handling capabilities. Lower running temperatures are achieved with the integrated cooling fan. The Titan 12T requires very little maintenance and is designed for consistent torque and high speeds from run to run, without fading. Revo-Spec Suspension: The unique Revo-Spec suspension geometry multiplies the suspension travel to lengths normally found on larger models. It provides true progressive rate performance that's light over the small bumps and instantly tightens when compressed to resist bottoming out over large jumps. Oil-Filled GTR Shocks: 1/16 Slash 4X4 's super-smooth oil-filled shocks damp the suspension and maintain control no matter how rugged the terrain. They are fully tuneable and include pressure bladders for air/oil separation and threaded spring pre-load collars for quick ride height adjustments. All-Terrain Tires & Wheels: Designed for all-terrain action, each corner of the 1/16 Slash 4X4 is equipped with pre-glued all-terrain tires on impressive beadlock-style wheels. The tires deliver the perfect balance of forward traction and side bite on asphalt, dirt, and any other surface you throw at them. 12mm mounting hexes open the door to additional wheel and tire combos to tune traction for specific surfaces—even foam tires for carpet racing. Race Replica Painted Bodies: No need for a paint or sticker session; 1/16 Slash 4X4 rolls out of the box ready for action with a factory-finished and mounted Race Replica body and decals already applied for you, so its Ready-to-Race. 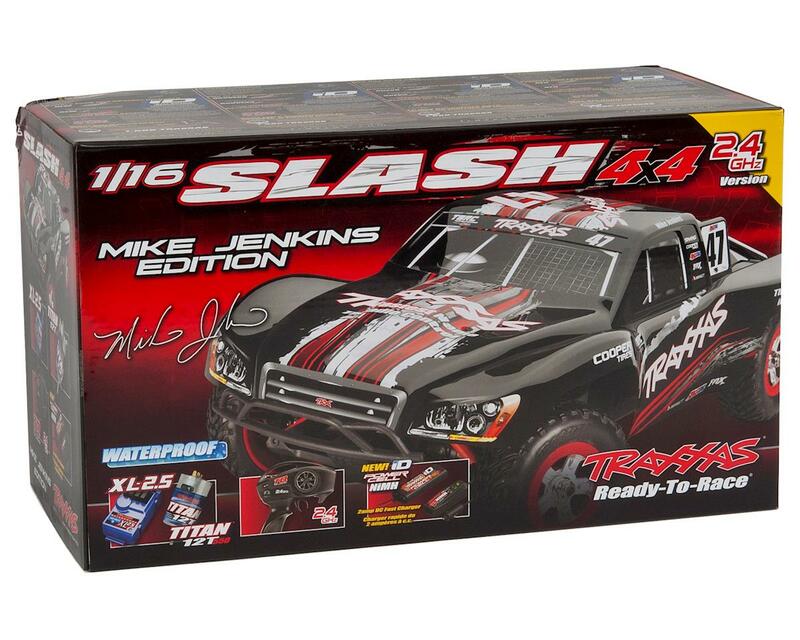 Traxxas 1/16 Slash 4X4 is available in four Race Replica versions: Mike Jenkins (Traxxas #47), Mark Jenkins (Traxxas #25), Scott Douglas Edition (Amsoil), and Greg Adler (4 Wheel Parts). Precision 2.4GHz Control: With the TQ 2.4GHz radio system, you just switch on and drive. There are no channels or frequencies to manage, so the focus is on having fun. The TQ’s ergonomic design is comfortable for all-day driving, and its sleek lines are enhanced by an internal antenna that is impervious to damage. To customize the controls, the transmitter’s factory servo directions can be easily reversed using the TQ’s simple programming system. Traxxas High-Current Connectors: The High-Current connector is more than just another connector, it's a virtual fail-safe. Each High-Current connector is specifically designed to mate with the proper charger. This means no more accidentally charging a LiPo on a NiMH charger. Ball-Bearing Transmission With Torque Control Slipper Clutch: 1/16 Slash 4X4's high-efficiency, heavy-duty transmission is built for brushless power when you're ready to Power Up. An adjustable slipper clutch lets you tailor power delivery to suit the terrain and your driving style, and precision ball-bearings make certain every ounce of Titan torque is transferred to the wheels. Full-Time 4WD With Sealed, Silicone-Filled Differentials: Sealed, silicone-filled differentials resist "unloading" for superior performance and authentic handling as you drift the 1/16 Slash 4X4 through corners with precision and control. The viscosity of the differential fluid has been carefully tuned for exciting on-road performance, and the shaft-driven 4WD system delivers instant acceleration with proven efficiency and durability. Pivot Ball Suspension: The 1/16 Slash 4X4 features pivot-ball suspension for smooth suspension articulation and easy adjustment. Rubber-sealed ball bearings ward off dirt and debris as they increase precision and reduce friction, and the oversized 8x12mm inboard bearings maximize durability. 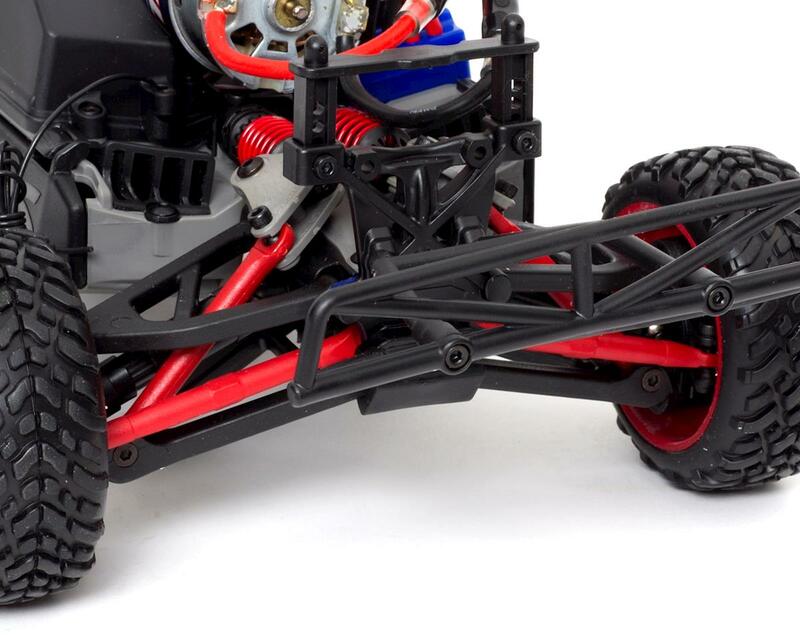 For extra security, the heavy-duty axle carriers are designed so the universal-joint axles' crosspins are captured by the inner bearings—another example of Traxxas' attention to every detail. Universal-Joint Driveshafts: High-performance on-road driving requires smooth, efficient power delivery as the car drifts through turns and powers from challenge to challenge with sustained steering input. Chattering dogbones won't cut it! Traxxas steps up with fully equipped telescoping universal-joint axles for optimum drivetrain efficiency and maximum power transfer. The true-curvilinear spline design operates freely, and the oversized U-joints set the standard for strength and high-power durability. Waterproof Electronics: Mud. Water. Snow. 1/16 Slash 4X4's waterproof electronics and fully sealed receiver box let you make tracks in conditions that leave other trucks parked at home. Traxxas' innovative, ground-breaking waterproof receiver box puts 1/16 Slash 4X4 in a league of its own. The antenna and servo wires route neatly through a special watertight seal (patent pending). To protect the receiver from dust and water a custom shaped blue O-ring seals the receiver box. Thanks to the unique design, the receiver can be removed for service and even aftermarket receivers can be used, without losing the sealing properties of the box. Digital High-Torque Waterproof Steering Servo: Small but powerful, the 1/16 Slash 4X4's 2080 servo cranks out 41.7 oz.-in. of tire-turning torque with digital circuitry for responsive control—even in water, mud and snow, thanks to its o-ring-sealed waterproof construction. Dual Battery Compartments: The 1/16 Slash 4X4 unleashes its full speed potential with the included Power Cell battery pack, but for extended run time and more "punch," the chassis' dual battery compartments let you add a second NiMH battery pack and Traxxas parallel connector (both sold separately) to double the available battery capacity. 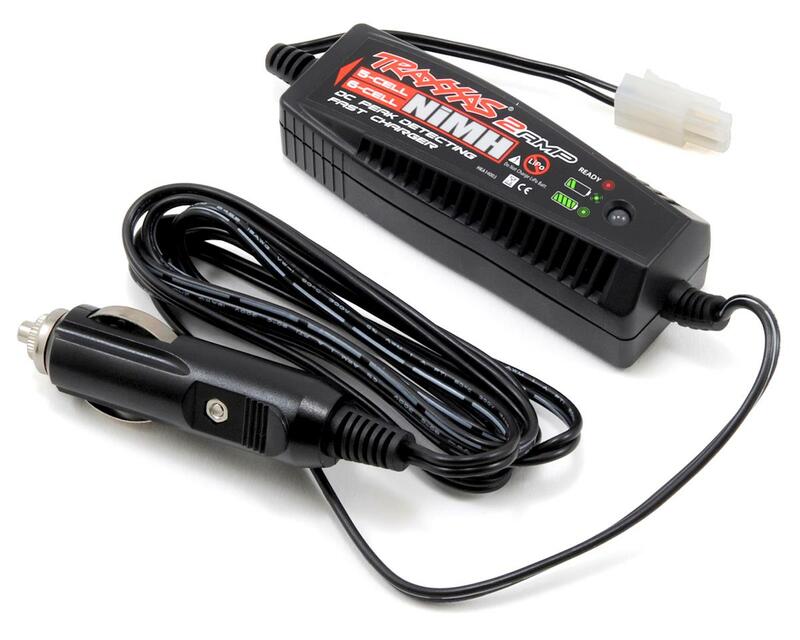 Traxxas Power Cell NiMH Battery Pack: 1/16 Slash 4X4 is fully assembled and Ready-To-Race with an included Power Cell NiMH battery and charger. 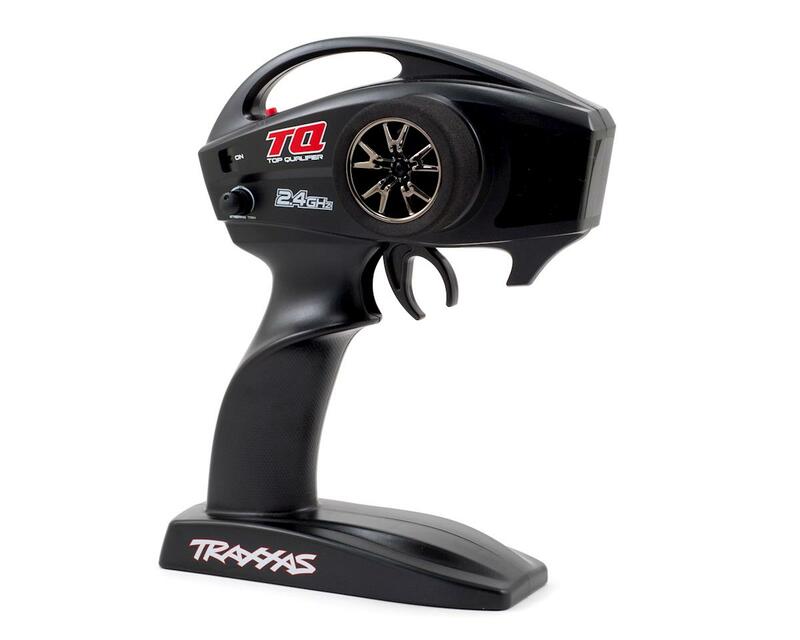 This potent pack features heavy-duty construction, 16-gauge wires and Traxxas' exclusive High-Current Connector for efficient power transfer, run after run. A convenient DC charger is also included. Everything you need to power-up is in the box. Quick-Release Battery Doors: Traxxas uses an innovative solution for easy battery installation. Quick release doors snap open and closed in seconds for fast and easy battery loading. There are no clips to lose in the field and the potential for fast battery changes during pit stops opens the door for a whole new class of electric racing. Battery Cooling Vents: Artfully designed intakes and exits allow cooling air to circulate through the battery enclosures to lower the temperature of the batteries for maximum run-time and "punch." Rubber-Sealed Ball Bearings: Precision rubber-sealed bearings offer the ultimate in low-friction performance and maximum protection in dirty environments. They are used in all exposed locations and are virtually maintenance free. Progressive Rate Travel: Innovative linkage-based suspension geometry multiplies suspension travel and increases spring and damping rates as the shocks are compressed for instant small-bump compliance without compromising shock-absorbing performance for big hits. Hex Hardware: Pro-quality, high-grade, metric hex-drive hardware is used throughout for extra strength, and easy maintenance and repair. The black-oxide rust-resistant finish provides a high tech-look and feel. Fully Customizable With Traxxas Factory Options: Designed and engineered for lasting performance, high precision, superior durability and unbeatable style, genuine Traxxas options for 1/16 Slash 4X4 are the perfect way to tailor your truck to the track, or just add the unique touches that make it your own. From red-anodized toe links and pushrods to CV axles and hard-anodized shock bodies, Traxxas offers a wide range of performance parts for the 1/16 Slash 4X4.